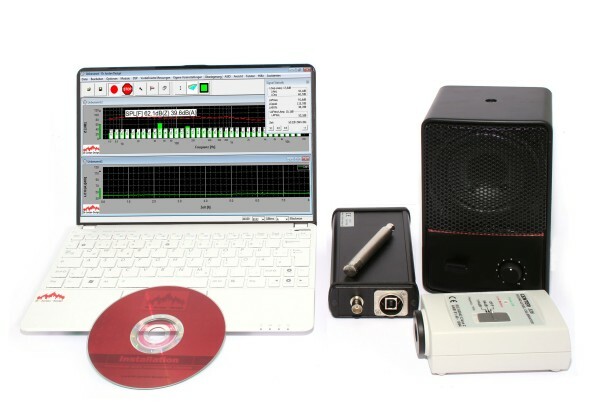 With WinAudioMLS you can perform a wide range of measurements for room acoustics. You can find a short description of reverberation time here. The complete description is inside the user manual. fast and reliable. In addition measurements via impulse excitation or switched noise are supported. Therefor WinAudioMLS supports all know techniques for measurements. By using small notebooks , you can easily build a mobile measurement system. The laptop and loudspeaker are not included in this package. All components have been carefully selected. You will only require a PC or Laptop running Microsoft Windows and a suitable active loudspeaker. For mobile measurements we can recommend this active loudspeaker. For precise measurements you will need an omni-directional soundsource (Dodekaeder). This package contains hardware and software. The software modules are marked in the following table. If you already own the required equipment you can order a software-only package.